In general, large complexes have many advantages stacked in their favour—mainly financial leeway to an extent and space set aside for processing waste. If not, they can carve out a corner on the terrace or basement to get going. I have seen this happening in several communities. But that’s just not the case with small communities. First of all, getting the community to think in favour of processing all streams of waste sensibly is a task fraught with imponderables. This often leaves well-meaning volunteers in despair who can afford only small risks and hope to convince the community to spend on composting. 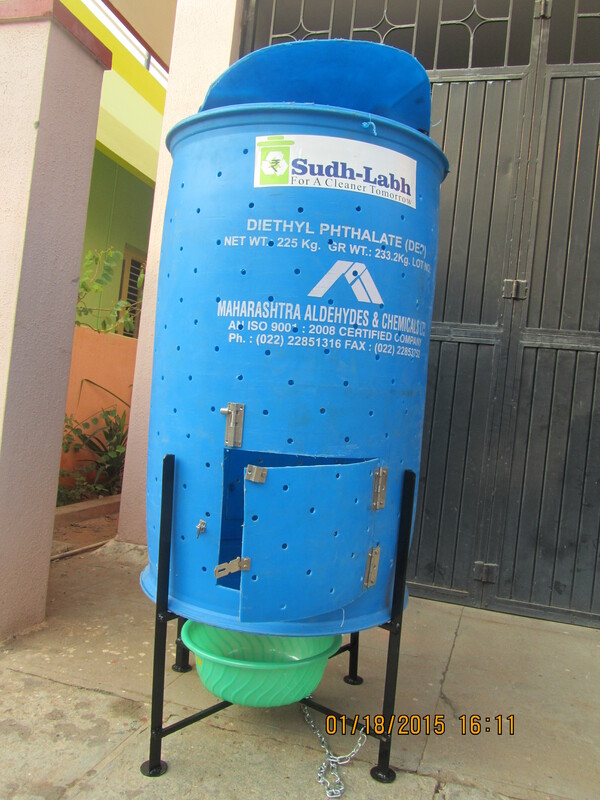 In this respect, Barrel Digester from Sudh-Labh is an apt fit for many reasons. It doesn’t drill a hole in your pocket, nor does it require an extra hand to run the show. It fits itself nicely into a small rain-proof spot. Last week, I picked out VM Meadows at Horamavu and Devina Fragrance at Bellandur for my research as composting was in its final stages in both locations. At VM Meadows, Sudh-Labh was running a pilot project as the residents wanted to see if the accelerators were indeed speeding up the process and also analyse odour, rodent and other issues. In Devina, just one digester installed on the terrace was well on its way to bring out fully done compost. As simple as it gets. The digester is the ubiquitous five-foot-tall blue drum made out of high-density polyethylene thermoplastic. A good deal of fabrication has gone into transforming this barrel into a digester. It is drilled with enough holes to aerate the contents inside and fixed to a one-foot-high MS iron stand which is coated with epoxy paint to avoid rusting. Underneath this, a plastic container can be placed to collect leachate, if any. The stand protects the barrel from being knocked down by strong winds and also helps keep the bottom aerated and the surface clean. A hatch at the bottom allows you to take out the compost as and when it is ready. For an apartment or a gated community of 10-15 houses generating around 5-7 kgs of kitchen waste per day, Subh-Labh recommends a 220-litre drum. “It takes 8-10 weeks for the first batch and later on, you can go on harvesting the compost as and when it’s ready. Hence, only one digester is enough for a community of this size,” says Vasuki Iyengar of Sudh-Labh. In both locations, composting was going on without the help of a shredder. Two ingredients are a must: Bio Clean cocopeat blocks loaded with microbes which accelerate the process and neem powder to control flies and insects, if any. Optional: You can use dry leaves to add brown content to the compost. If available, you can even add cow dung, cow urine, Panchagavya solutions or sour curd. All these ingredients not only speed up the process but also leave the compost enriched with high microbial load. They also repel rodents, insects and bad odour, etc. First, layer the bottom with five kgs of cocopeat, dry leaves and mature compost to absorb the moisture. For the first batch, Sudh-Labh supplies all these ingredients. Spread a thin layer of kitchen waste on top of this. Add about 100-200gms of Bio Clean powder. The next day onwards, add a layer each of kitchen waste (around 5kgs), Bio Clean (100-200gms) and some dry leaves. Once in a week, soak a handful of neem powder in water and sprinkle this on the decomposing mass. A suggestion: Instead of layering, mixing all these ingredients in recommended proportions also works. In our apartment where we have employed a similar method involving a cocopeat-based inoculant, our housekeeping staff found it easier to unload all the shredded kitchen waste on a plastic sheet, mix it with the inoculant. It is easier than layering method and the chances of going wrong with the thickness of the layers are absent. Moreover, manual mixing speeds up composting as the substrate gets coated with the inoculant evenly. The first harvest takes up to 8-10 weeks. Spread a plastic sheet on the floor, open the hatch and take out the compost using a rake. At both locations, I saw black and nice-smelling compost coming out of the two-month-long composting process. If there is too much of moisture, you can aerate it in shade for a couple of days before storing it. Do not sun-dry the compost. Sieve it and take out the semi-done chunks and put them back into the digester. I did not notice any foul odour in either of the locations visited. “So far, we haven’t come across any rodent issues,” stated Vasuki. The aerobic digester comes at Rs 6,000 with a kit containing all the ingredients to kickstart the first batch of composting—cocopeat blocks, mature compost, dry leaves and Bio Clean powder. Thereafter, the customers have to buy accelerators and other ingredients. That would mean Rs 600 to Rs 400 one-time cost per house for a community of 10-15 houses. Bio Clean powder with neem powder if used along with browns (dry leaves): Rs 300. 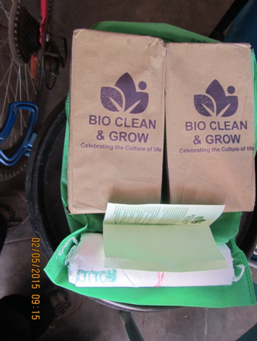 Bio Clean powder with neem powder without browns: Rs 500. The break-up: Monthly expenditure can range from Rs 20 to 100 depending on which option you go for and whether it is a 10- or 15-unit community. Please note: According to Sudh-Labh, sieved compost or manure can also be added back three times instead of Bio Clean and browns, thereby reducing the operational cost further. So is its portability. Large gated communities with no space for composting can have these installed in various spots. Small offices can make do with just one. Terrace gardeners who require large quantities of compost can go for this. This product is not location-specific. So long as it is protected from rains, it can be placed on the terrace, in parking lots, basements, garden areas, backyard or anywhere else. At Krishna Lilac Apartments, Sarjapur Road. Sudh-Labh, No. C-3, 906, L & T South City, Bannerghatta Road, Bangalore 560076, Phone: +91 98456 90778. http://www.sudh-labh.in. 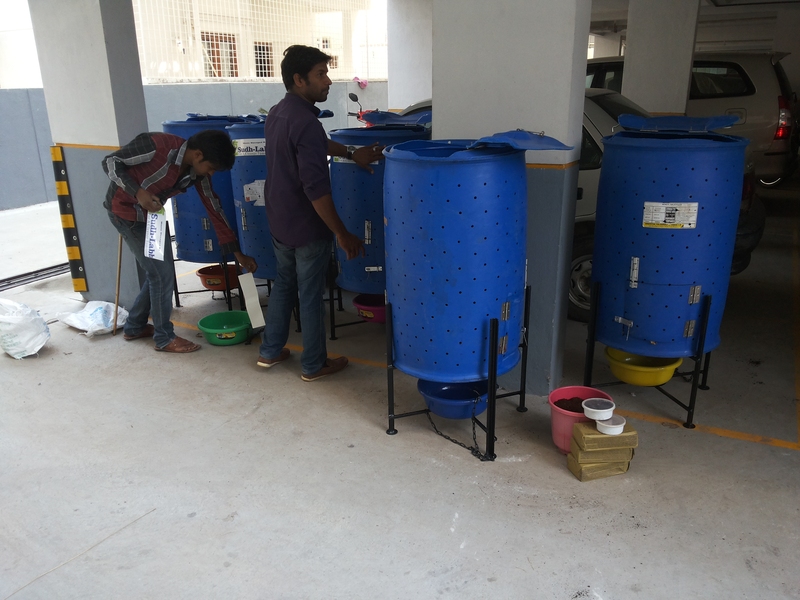 This entry was posted in Community Composting, Endlessly Green and tagged Barrel Digester from Sudh-Labh, Bioclean, community composting, composting, kitchen waste, Rajarajeshwarinagar. Krishna Lilac, Sudh-Labh, SV Pragathi, Vakil Gardens. Bookmark the permalink. Thanks Savitha! Very well drafted. I am sure most small community apartments will consider giving this digester a try. All documented here in this blog. Please explore it. Thanks. Savita– We live in a 264 flat community with almost no extra space for a conventional owc. Lack of space, smell issues and rodents would be the biggest hurdles for us. We also have a large snake population in the vicinity who may be attracted by the rodents. Can you please suggest which composting system will work best for us. Thanks.